It was one of those completely impulsive moments. I went out to get the mail, and I tried to ignore him in the corner, but how could you? Yuck. Dead as a door nail. 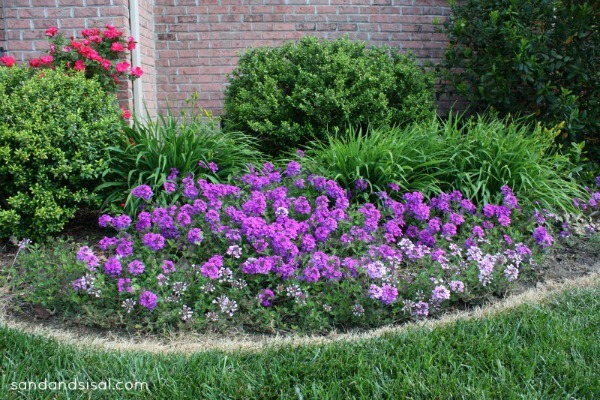 Can we say brown thumb with this one? He needed to go. Then I turn to open my door.Yuck again. The front door color was brown. I’m tired of brown. It’s spring! I want happy, fun color! It was time for a change. I had won a can of Annie Sloan Chalk Paint in the turquoise color Florence at a conference and thought, why not try it out on the door? It was done in about 30 minutes. Just paint it on with a good quality 2.5″ angled brush, allow to dry and then with a straight razor blade, scrape off any paint you might have gotten on the glass. ASCP dries very fast and I was able to rub a light coat of the soft wax over it afterwards. Change is good I believe. 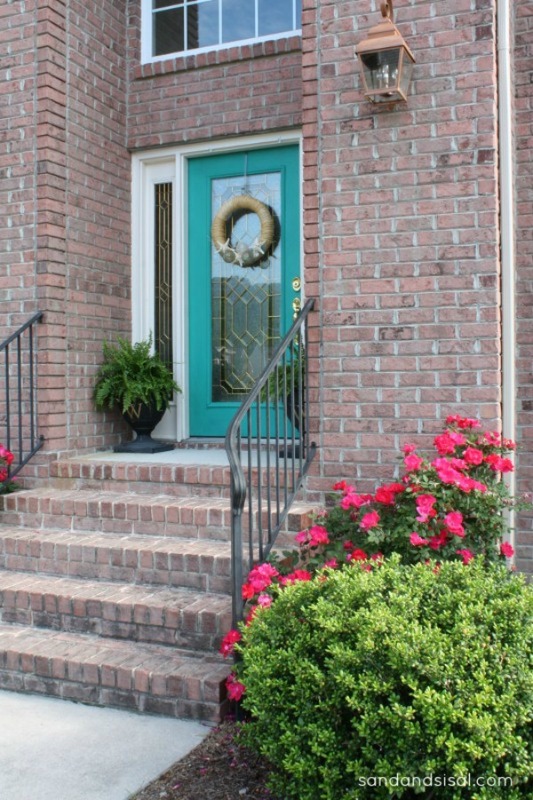 Choosing a front door color can be difficult, especially if your brick is a salmon color. Our door has been black, red, coral, and espresso. But today it’s color me turquoise! Bright and cheery, springy and fresh is what it says now. The Glass Float Wreath says this house is ready for warm weather! My kids hate it. Ha! 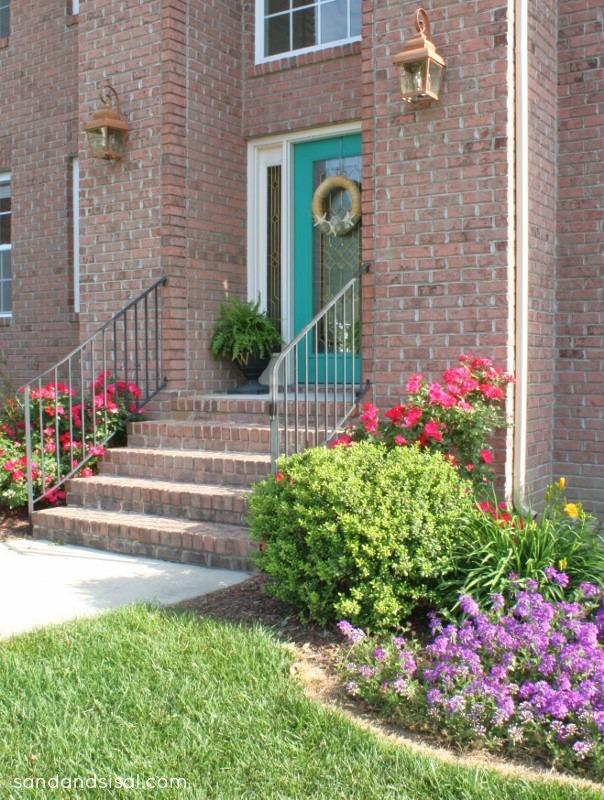 But that’s ok. I’ll change my mind again and the front door color will most likely get a seasonal makeover in the fall. Let me know, do you change your door color often also? 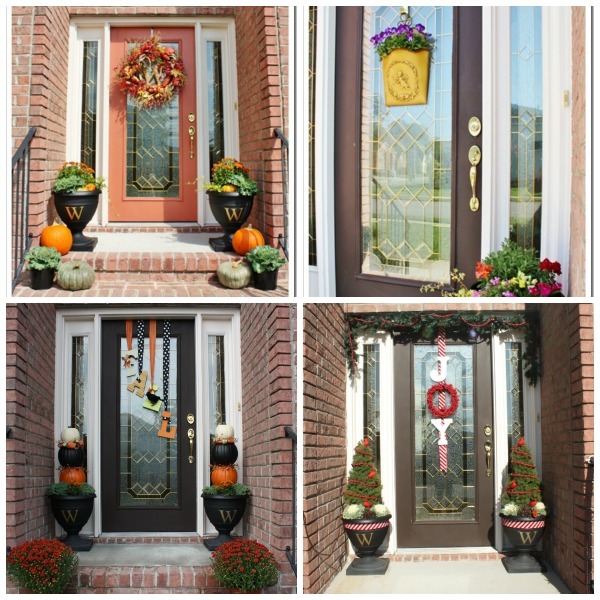 I am dying to change our boring tan front door into something bright and vibrant! The turquoise looks great! I painted my front door this color at Christmas. I had an accent table already on my front porch so decorated it with turquoise, lime green, fuschia, and royal blue for Christmas. I even spray painted a green wreath with accents of fuschia and turquoise. LOVED IT!!!! I LOVE it! I really want to paint my front door a fun, vibrant color, but my house siding is a greyish blue. I’m not sure what color would look good with it. I painted my door black last year (it was wood that hadn’t been cared for in twenty years and looked horrible). Now I’m thinking maybe celery green would look good. I love it!!! Our brick is very close to yours and I haven’t been able to figure out what to do. We moved in a year ago and the door, shutters and garage door were a plum colour what faded and looked terrible. I painted the door black and the shutters and garage door a gray with a hint of green. I don’t love it. I have been considering a turquoise door (my hubby thinks I’m nuts) but then I have no idea what to do my shutters and garage door…tooooo many decisions!! Wising you a great weekend. I have that same brick and just painted the door and shutters dark chocolate yesterday. I don’t love it, wished I would have had seen your post before I painted. If I had, I would be a much happier camper than I am right now. Love that you used a bold color! Looks fantastic!! 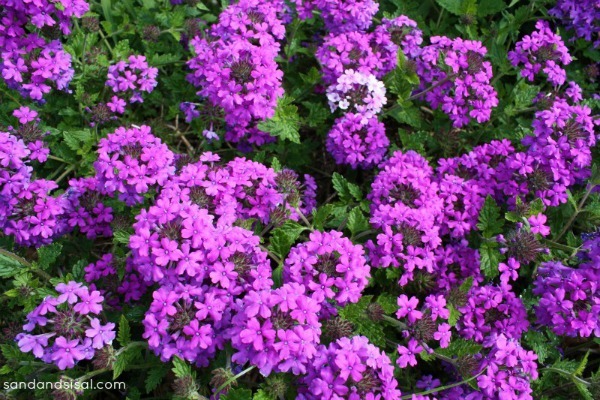 Love that colour – makes me want to paint my door -hmmm…you’ve got me thinking!! 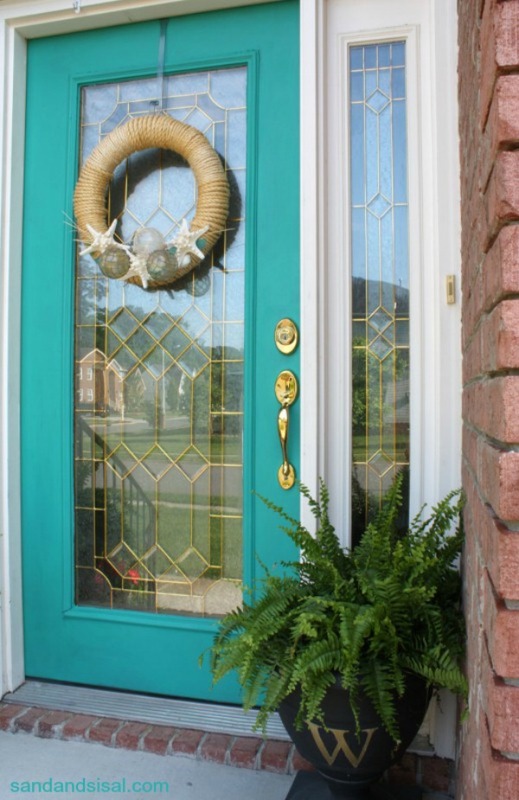 I wish I could change my front door, but it is a solid mahogany door with beveled leaded glass, so I just do easy maintenance on it (did a DIY post) to keep it shiny and tidy. 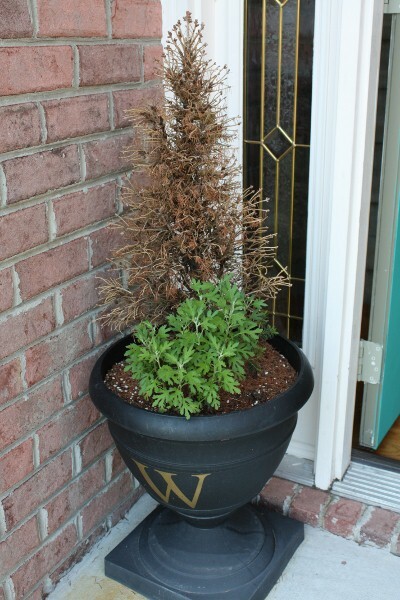 I change things up by changing plants and the color of the containers. 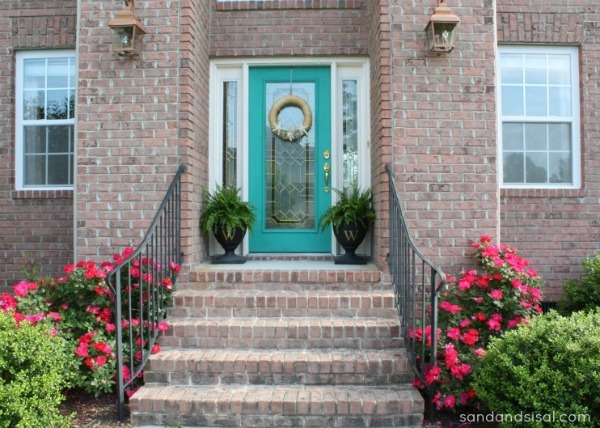 I like your new turquoise door…..very welcoming and cheering. It can be a bit scary painting a door a vibrant color the first time, but once you do it, it is no big deal to change it up, and fun to boot! Enjoy! I love it! Maybe I will steal your idea! You’ve got such a lovely house and that front door is a knock-out. Have you ever thought of going blue-gray? I just painted two bedrooms BM Nimbus Gray. I’m seriously in love! I LOVE it, Kim! Mine has been the same color for years, but I’m thinking it’s time for a change! Wow, I love it! Looks great and I love the wreath too! I’ve been trying to get the nerve up to paint my door turquoise. Did you paint the inside too? Same color? Hey! LOVE your door! 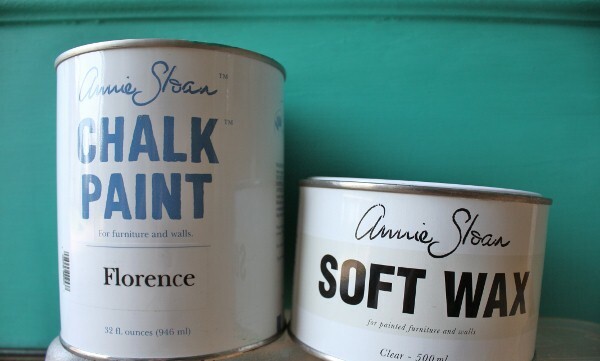 I am just now getting into Annie Sloan paint and was thinking of painting my front door with it. I just wondered how it easy it is to paint over ASCP it if i ever change my mind? That door looks amazing! That’s the best colour yet! I hope you haven’t changed it??? 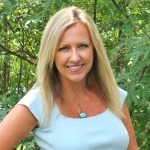 Hi Lisa, don’t be sad… but I did. It’s now a more muted shade of greenish gray blue.